We're about halfway through the Selvage Along already! I realized this on Thursday when Renee posted her selvage sewing on Instagram. At that point, I hadn't actually started my own selvage project (not including the selvage strip pillow, which my CJMQG friend Janet now owns). I was encourage by your comments to actually start my epic selvage rainbow bookcase quilt (thank you! ), and I am absolutely IN LOVE with everything about it. I've always wanted to make one to hang next to my bookcase and/or in my future children's play area one day. I think what was stumping me was the background; I didn't want it to be all solid white (and brown and I just don't go well together, so it was definitely going to be white, like my own bookcase). Then, I saw this photo on Pinterest, and I thought, ooh, maybe it can be more of a staggered/nontraditional bookcase. So I pulled out my low volume fabrics and started improvising (that's how I work best - no pattern to follow and a vague sense of the finished product). The Doe fabric (the strip on the bottom of the top two "shelves"), for now, is going to help me separate shelf to shelf. I want it to be subtle instead of each shelf outlined in a solid color or something. All the saturated selvages I plan to include - obviously, more purple than anything else! 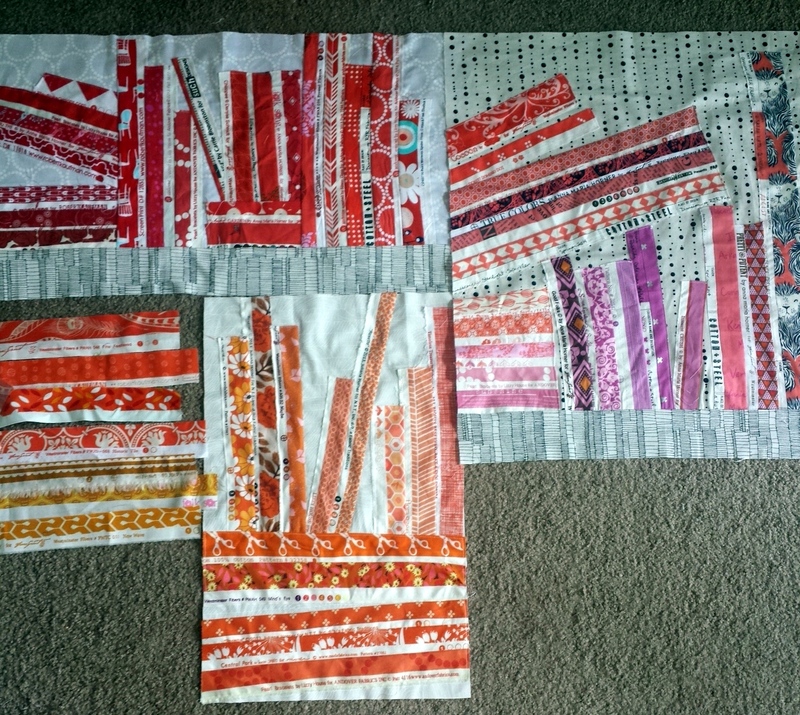 I'm laying out the selvages on the background before I make each block, and then I applique them. Sometimes I sew a bunch together and then stitch and flip the whole piece onto the background, or I sew one at a time if I want them to be a bit wonky (I usually stitch the cotton side right sides together to the background and then flip; selvages are great because the white part with the words doesn't really fray, unless it's a ruffly selvage). Then, I just press and stitch down the white part on top. I am having a blast placing the books and I can't wait to share more as it develops. If I'm really motivated and I keep working on it in between commissions, I might have the top done for the end of the selvage-along. Make sure you check out the Selvage Zippy Pouch Tutorial over at Made by ChrissieD today! Share the selvage projects you've been working on the last couple of weeks! There will be a final linky party in September, too, just in case you haven't started yet. :) Remember, you can tag #selvagealong on Instagram, and you can link up IG pictures in the link up, too. August 10 - Selvage Zippy Pouch Tutorial by Chris @ Made by ChrissieD + mid-way/check-in linky on both blogs <<<You are here! Love what you're doing with your selvages! Plus this is such a fun way to use up a bunch! 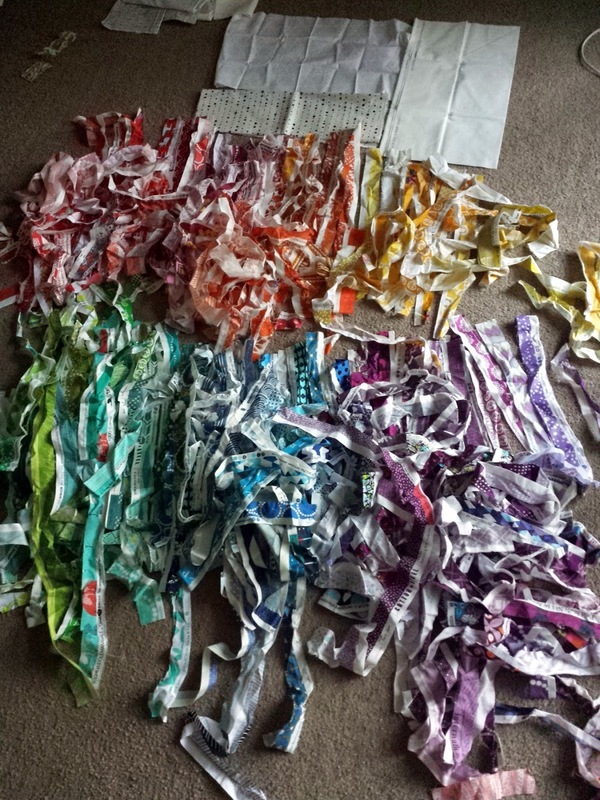 I have to wipe my chin a little after I look at those rainbow-y piles of selvage. They make me so very happy! The bookcase is coming along nicely! What a fabulous project! Your rainbow selvedges are so yummy! Looks great. I'm looking forward your progress and the final outcome!